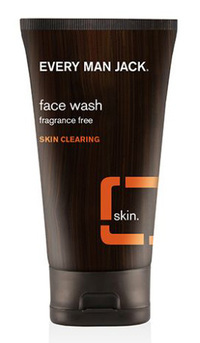 Face Wash - Fragrance Free, 5 fl oz (Every Man Jack) - Penn Herb Co. Ltd.
Wash away deep-down dirt and oil for clearer looking skin. 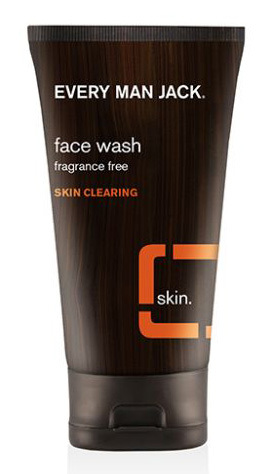 Salicylic Acid treats and prevents breakouts, while coconut-derived surfactants gently clean. Aloe, chamomile, and glycerin soothe and hydrate. ACTIVE INGREDIENT: Salicylic Acid 2.0%. INACTIVE INGREDIENTS: Aqua/Water/Eau, Aloe Barbadensis Leaf Juice, Disodium C14-16 Olefin Sulfonate, Cocomidopropyl Betaine, Sodium Cocoyl Glutamate, Sodium Cocoyl Isethionate, Glycerin, Citric Acid, Panthenol (Vitamin B5), Napca, Magnesium Ascorbyl Phosphate, Allantoin, Arnica Extract, White Tea Extract, Chamomile Extract, Rose Hip Oil, Borage Oil, Flax Seed Oil, Potassium Sorbate, Sodium Benzoate, Ethyl Hexyl Glycerin. Naturally Derived. Cruelty Free. Gluten Free. Non-GMO. For the management of acne. Skin clearing formula with maximum strength acne fighting medicine will take care of current breakouts and help prevent future ones. Cleanse morning and night. Wet face. Apply into hands, lather with water. Massage face gently. Rinse thoroughly. Dry with clean towel.